Over the last year, and especially in the last six months, there’s been a lot of conversation surrounding CBD oil. It’s been touted as a supplement to help calm your pets, as a way to alieviate persistent pain in humans, and even as a potential treatment for acne. It’s also been heralded for its moisturizing and acne-curing capabilities. For example, Milk Makeup just launched its KUSH Mascara, which contains industrial hemp-based CBD oil, and there are a number of face creams, serums, and oils that utilize the hemp-y goodness, too. To see if it’s as effective as companies claim, we reached out to a handful of experts for their input. Here’s what we learned. What Is CBD Oil? And Is It Legal? Interestingly, CBD as a skin care ingredient has been around for quite a while. However, it’s having a real moment right now thanks to a wider discussion around pot legalization, as well as a handful of studies regarding its medicinal merit that have been published in recent years. Before we dive into all that, though, let’s first wrap our heads around what CBD is. “CBD is an abbreviation for Cannabidiol, which is a type of cannabinoid. Cannabinoids are a group of more than 104 biologically active chemical agents which are present in our nervous systems (endocannabinoids), produced by plants (phytocannabinoids), or developed artificially in laboratories (synthetic cannabinoids),” says Caren Campbell, a board-certified dermatologist based in San Francisco. To answer the question you might be asking yourself… No, you cannot get high from CBD. Campbell explains that CBD is extracted from the hemp part of the marijuana plant. Therefore, it contains zero to trace amounts of tetrahydrocannabinol (THC), which is what’s responsible for that psychoactive high associated with marijuana. But Is It Actually Effective in Skin Care? Campbell says there have been a small number of studies specifically on CBD and phytocannabinoids. However, she noted that many of these studies were conducted on mice or were uncontrolled human topical studies with synthetic cannabinoid agonists and antagonists, rather than phytocannabinoids. Clearly, we still have a long way to go in terms of research. As of right now, though, results are favorable in terms of CBD’s topical and oral benefits. To put that in easier-to-understand terms, CBD oil may prove to have anti-inflammatory benefits that may help with eczema, itching, and pain. Additionally, a 2015 study discovered that using CBD oil in dermatology helped reduce oil and redness, which was particularly beneficial to those with acne, rosacea, and dandruff. And interestingly, Campbell pointed out that the United States’ Department of Health and Human Services has a patent on cannabinoid as an anti-oxidant, which would potentially have anti-aging and protective benefits for the skin. So, to address the “is it effective?” question head on, the answer is that the jury is still out, but that signs are promising. Before casting all your hope in CBD, Campbell advises we wait for results from randomized, double-blinded, placebo-controlled studies in acne, eczema, itch and pain. If you’ve taken the aforementioned information to heart and want to experiment with CBD oil as a potential treatment for your acne, here’s what you need to know. Ultimately, we recommend using legal products that contain high-quality CBD oil, and that ideally contain other ingredients known to soothe, heal, and treat acne-prone skin. She noted that most industrial hemp is cultivated in Northern Europe and Spain, but that in recent years there’s been a boom in hemp cultivation in the United States. Good quality hemp may come from Kentucky, Oregon, Colorado, and California, she said, adding that New York has started a research initiative on industrial hemp, as well. 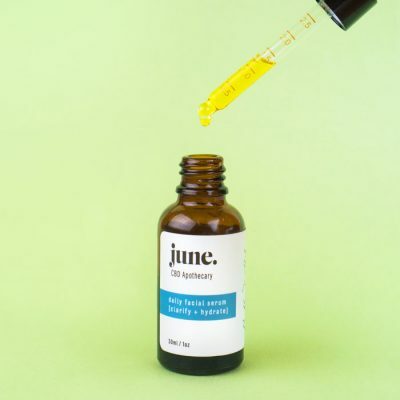 If you’re buying straight CBD oil, Guanche said to seek a product that has third-party lab results, that the oil is pressed via CO2 extraction, and that it contains less than .03% THC. This is about as far as we can take you on this CBD journey. We urge you to shop smart, and to understand that there’s no concrete answer (yet) about CBD’s dermatological benefits. Personally, we’ll be waiting patiently for those double-blind studies, and will stick to the ingredients that have already been proven effective until then! + What do you think? Have you used CBD oil for acne? What were your results? Share your thoughts in the comments!